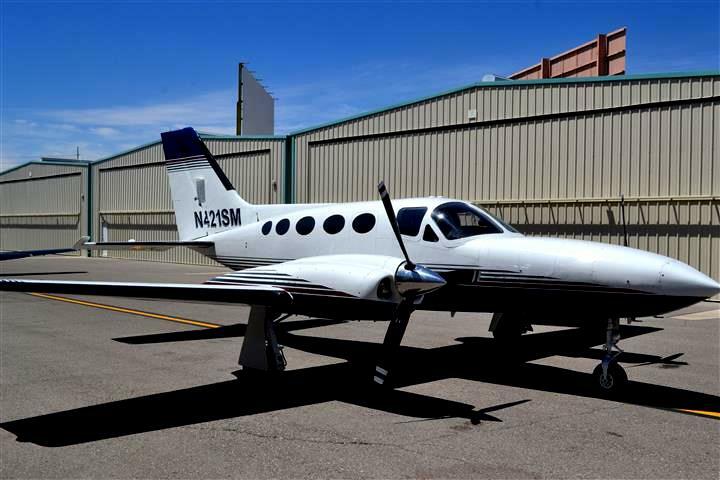 We are proud to bring this gorgeous 1976 Cessna 340A to market! With RAM VII Engines, beautiful paint/interior, solid panel w/WAAS, several accents for ramp appeal, incredible maintenance records, and meticulous/clean owner for the past 10 years. We argue that this is one of the nicest 340A's out for sale! Many features of this aircraft will keep you and your passengers smiling while enjoying a smooth ride. Exterior and interior look new with touchups made by Straube's to keep this bird shining. Panel has all the right features with 530 and 430 both WAAS. GDL 69 for weather with a nice sized display on the MX20. Estically one of the nicest looking panels with Carbon fiber back and accents. Blue lighting for great night flying. Glass looks new with no crazing. Pressurization recently gone through and works great. Owner is a Citation pilot and keeps this piston maintained to the same levels. Recently (12/2016) had extensive work and annual performed at Steve's Aircraft in Lakeport, CA. New exhaust, firewalls repaired, rerigging performed, and much more done. See recent logbook scans for all info. Gross Weight increase to 6,390 lbs! Alcohol Windshield and Boots for DE-ICE. Boots in like new condition. Blue Ring Lighting and Above panel Lighting. Looks amazing and makes for great visibilty during night flights! Left - 78/80/75/78/70/68 over 80. Right - 80/71/75/80/75/80 over 80. Left Engine - #2 Cylinder and connecting rods repaired. Right Engine - #1, #4, and #6 cylinders and connecting rods repaired. New Exhaust on both engines! New Paint by Straube's Aircraft Services in 2005. White with Blue/Gray accent lines. Touchups made over the past 10 years. Paint looks new and in great condition! Great list of mods and notables! - SP8000 Spoilers for great descents and protection of the RAM VII's. - Carbon Fiber Instument Panel and accent throughout cockpit and cabin. - Blue Accent Lighting for instrument panel. - Boom Mike (pilot side) for headset free flying. - Several exterior parts chromed to add to the ramp appeal! Cream colored leather in outstanding condition. Blue carpet in outstading condition. Mats on floor help maintain the quality and condition. Interior looks and feels new! Engine cylinders repaired on both engines. Good compressions all around. Changed vacuum regulators and filters. NEW Components and SBs performed! Replaced many O-Rings and Caps.